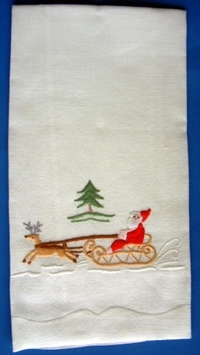 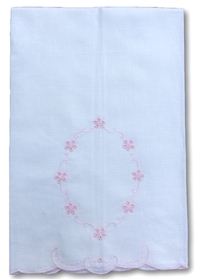 A Traditional Pattern Embroidred in Ecru on White Linen. 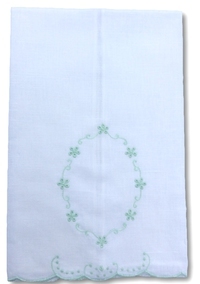 Hand Made in the Azores, Portugal. 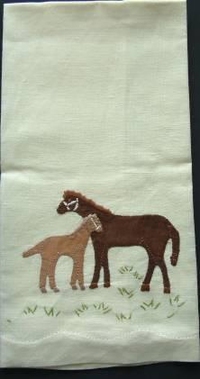 14" x 20"
Mare and Foal on ecru linen. 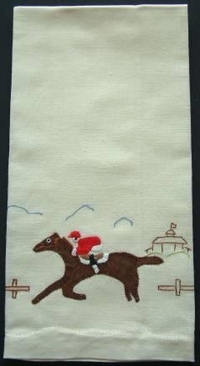 Ecru linen with Race Horse. 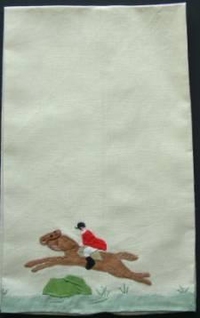 Riding Tack on ecru linen. 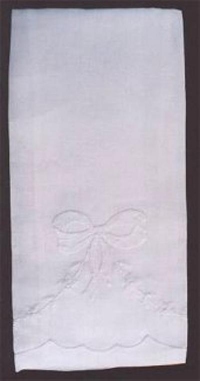 Ecru linen fox hunt guest towel. 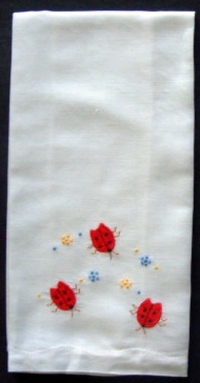 White Linen with appliqued ladybugs. 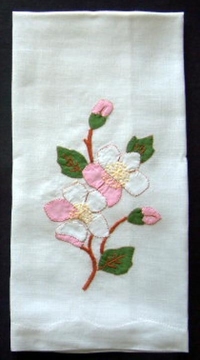 14" x 20"
White Linen with appliqued dogwood. 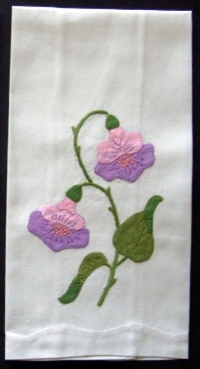 14" x 20"
White Linen with purple appliqued flowers. 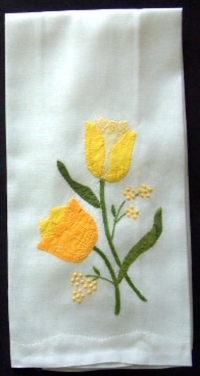 White Linen with yellow appliqued tulips. 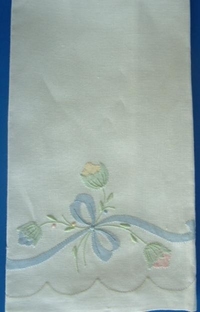 14" x 20"
14" x 20" White linen with multi color embroidery. 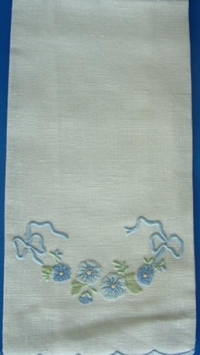 14" x 20" White linen with blue or pink flowers. 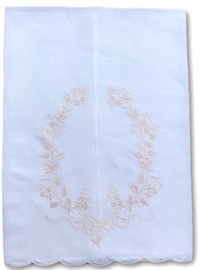 14" x 20" White linen with taupe edge. 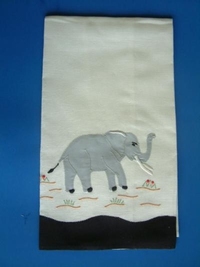 A beautiful Madiera hand made work of art. 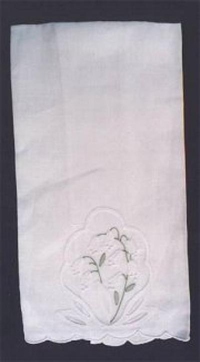 14" x 20" White linen with black edge. 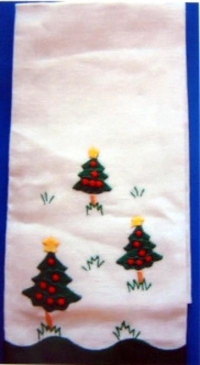 Hand Made in madeira by expert Needleworkers. 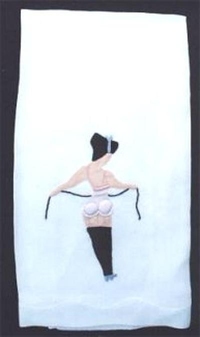 This is an artform that will not be with us much longer. 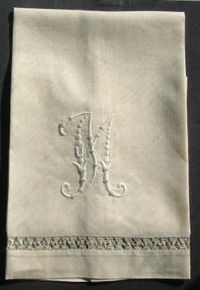 14" x 20" White linen with taupe edge. 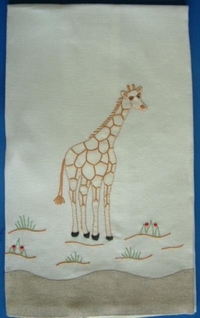 A Handmade work of Art to complement the Cheetah, Lion or Giraffe. 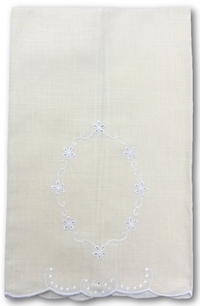 14" x 20" White linen with taupe edge. 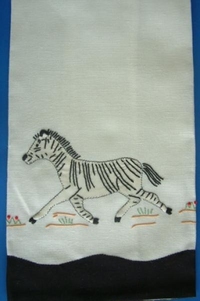 Hand Made in Madeira and gets along well with Cheetahs, Giraffes and Monkeys ! 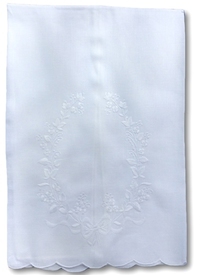 14" x 20" White Linen with ecru hem. 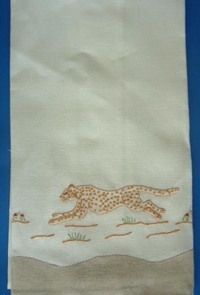 The Classic running Cheetah. 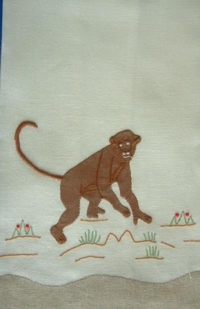 Hand made in Madeira by the finest needle workers. 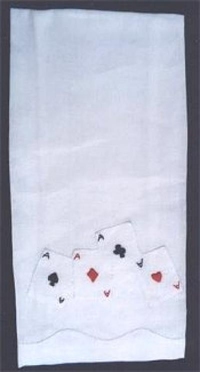 White Linen with 4 Aces playing card applique and embroidery. 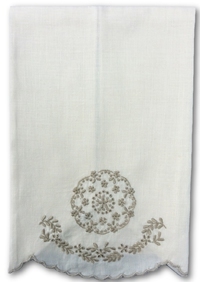 White linen guest towel with vintage maiden embroidery. 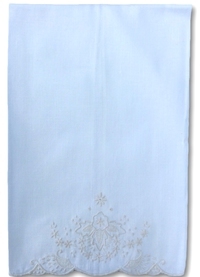 14" x 20"
Linen vintage maiden with a sheer see through skirt guest towel. 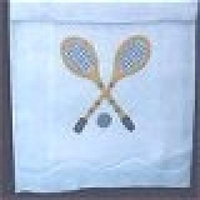 14" x 20"
White Linen with embroidered tennis racquets. 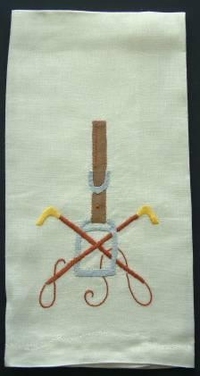 14" x 20"
White Linen with embroidered Golf bag. 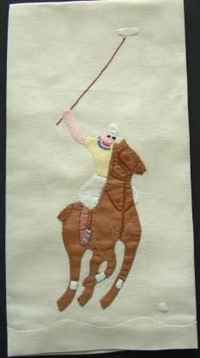 Also available with tennis racquets. 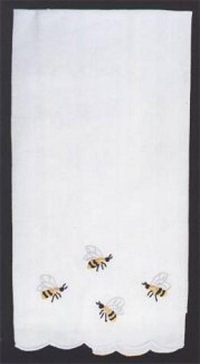 14" x 20"
White Linen guest towel with bee embroidery. 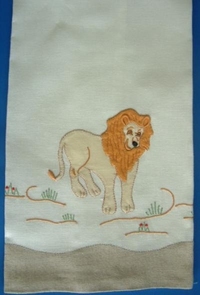 14" x 20"
Traditional Ecru embroidery on white linen. 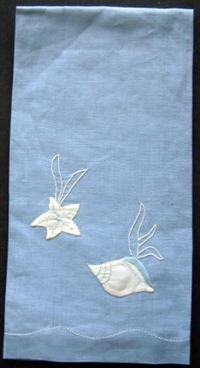 14" x 20"
Blue linen with white appliqued seashells. 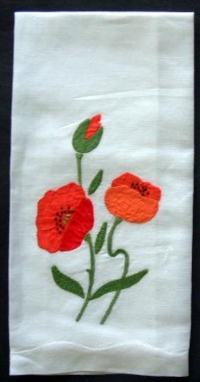 White Linen with appliqued poppies. 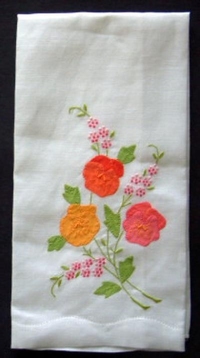 14" x 20"
White Linen with multi bright colors embroidered and appliqued flowers. 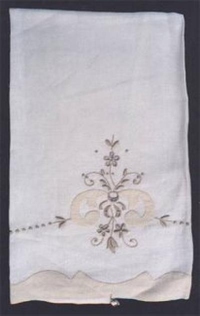 14" x 20"
14" x 20" Ecru linen with taupe edge. 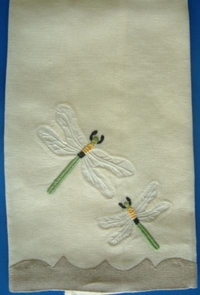 Organdy wings. 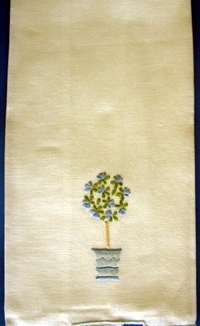 14" x 20" White linen with pink or blue topiary. 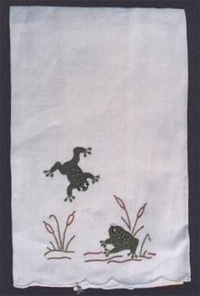 White linen with hand embroidered frogs.